Rite in the Rain weather proof notebook. 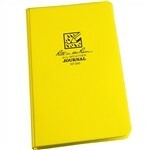 4 3/4" X 7 1/2" bound hard cover (Polydura), Yellow. 160 pages, (80 sheets), page layout is level, 6 vertical columns with 25 horizontal lines. The only books made with true outdoor durable components. The cover, the paper, the sewn-in pages, even the glue is designed to withstand the elements. This is a PolyDura Hard Bound Field book with 4 3/4 in x 7 1/2 in sewn pages. Polydura covers are a smooth plastic material constructed with post-consumer waste. They're virtually indestructible.